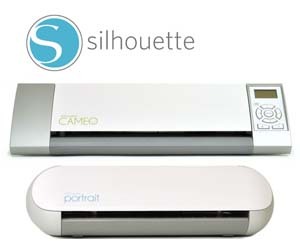 I am super excited to announce that thanks to Silhouette, I am giving away another Silhouette Portrait cutting machine! One of my lucky subscribers or followers will win their very own Silhouette Portrait! To enter to win the Silhouette Portrait cutting machine, you need to be a subscriber or follower of my blog. You can sign up over on the right side of this blog (if you are not there already) and leave a comment under this post. Only one comment per person please. For an additional chance to win, please follow my Facebook page, if you have not already, and leave an additional comment on this post that you did. You have until midnight MDT on Saturday April 20 to enter and the winner will be announced on Sunday April 21th. Now for more wonderful news Silhouette is having a mega sale! 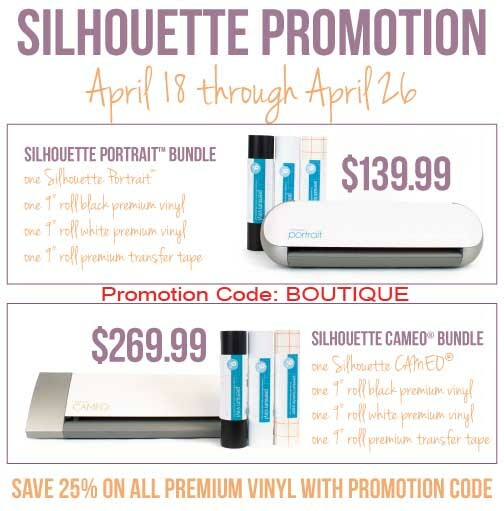 You can purchase the Silhouette Portrait™ packaged with one roll of black vinyl, 1 roll of white vinyl, and 1 roll of transfer paper for $139.99 or the Cameo packaged with one roll of black vinyl, 1 roll of white vinyl, and 1 roll of transfer paper for $269.99. For those of you that already have a Silhouette cutting machine you can purchase the premium vinyl for 25% off. Silhouette recently lowered the price of their premium vinyl from $14.99 to $9.99 and now you can get an additional 25% off. Click here and type in the Promo Code BOUTIQUE when you order to receive the savings. I confess this is my first time using vinyl and I am in love! You will not be disappointed with this vinyl! Silhouette’s premium vinyl cuts like butter. This intricate doily image was designed by Samantha Walker and when you open this image it is sized at 11.7 inches. I decided to test the limits of my Cameo and the premium vinyl so I cut this intricate doily at 3.25 inches and the cut turned out perfect! I set the blade to 1, speed to 6 and pressure at 9. I was speechless when I saw this cut! I wish you could see me doing my happy dance! I love binder clips and I use this image to decorate my metal storage container. This vinyl is addictive! You are going to love using Silhouette Vinyl and I plan to make more vinyl projects! I might even make a video. Have a great day and click here if you would like to order any of the above products. Remember to click here to order and the promo code is BOUTIQUE. Please feel free to spread the word and don’t forget to enter my giveaway! I follow your blog. Love your project. Already a follower and thanks for the chance to win!!! I have been a blog follower of yours for quite a long time already :) Thanks for a fabulous chance to win! Thanks for the opportunity to win a Portrait.I am retiring soon and the Portrait would be a perfect addition to living "on the Road" in our very small motorhome. That way my card making can continue during our months of traveling. I can't imagine living without a cutting machine. Love the project. Please enter me in the giveaway. I have been a follower for awhile. Love all your videos, also follow on facebook thanks for awesome giveaway. I would be blessed to win a Silhouette, thanks for the chance to win! I also follow you on Facebook, as well as by email. I follow you on your blog. Love all your ideas. Thanks for the chance to win. Thanks so much for the opportunity to win this innovative machine. I'm seeing new ways to use it all the time, especially thanks to all your wonderful lessons! I am already a dedicated follower of your blog! Already liked your page on facebook! Thanks for the opportunity to win as well as the great stuff you post! Your project is just beautiful! I am a follower. Thank you for the chance to win this amazing machine! Fabulous project! I follow your blog and receive your feed email. I am a Facebook fan for your page! Thanks for the chance to win. I love your idea for embellishing a simple metal tin. Your creation is beautiful. Hi Linda Great giveaway!!! I am a follower, subscriber & a fan on your facebook page. I would love to win this sweet cutting machine. That vinyl project is so awesome. Thx for sharing. God bless your day. Love the vinyl cut. Its amazing the fine detail these machines can cut. Would love the opportunity to win. Wow another great giveaway. I am a loyal follower of your blog and will have to ck out your FB page. OMGoodness!!!!! I would love to win this!!!! I am a long time follower and subscriber! Thanks for the chance to win! I love your blog and all of your tutorials. If I win I will give the cutter to my daughter. Wow! How exciting!!! I am drooling as I type ! Thank you ! I sure hope I win! !! Would love to owner a Silhouette. The videos you do are amazing. In fact I would love to WIN anything. Already a follower. Thank you for this chance to win the Silhouette Portrait. Your projects are amazing and I would love to be able to create some of them. I'm already a follower on facebook also. What a useful "must have" gadget. I love all these new innovations. They make life easier for the crafter and produce such professional looking results. Love this machine. So so many cool creative things to make! I enjoy your blog almost everyday and would love to have the Portrait. I have two Cricuts and a Gypsy and cannot rationalize buying one of the Silhouette products at this time but I want one really badly. Wish I had known about them first. I have been following you by email for a while! Thanks for the great giveaway!! I love your blog and have been a follower for quite a while. Thanks so much for the chance to win! Thank you so much for giving someone the opportunity to win the Silhouette. I love your blog, I have learned so much from you. So excited to have a chance to win one of these...would love to try out a vinyl project like this. Thank you! Love your project. Would love to have the Silhourette Portrait. Left you a message on facebook, great ideas there and love your blog, thank you for the chance to win the silhouette, have wanted one for so long. I love your tin can storage project. Have to try that out sometime. Thanks for the chance to win. I cannot imagine the happy dance I would do if I won. I am a follower and on fb as well. You make me want to try vinyl again. Amazing offer - thanks for the chance! I always wanted to try vinyl! That tin looks great! I follow you on your blog and just started following you on facebook. "Liked" your facebook page. Thanks for the chance. I follow your blog and love it. Great giveaway. New follower on facebook. Thanks for the chance to win! I follow your blog daily and your projects always amaze me. Thanks for the chance to win this wonderful product. I do not have one and would love to own one. Thanks. A Silhouette!! What a fabulous prize, Linda! I have not tried vinyl yet, but your experience encourages me to try. Isn't vinyl the best? So easy to work with and SO versatile. I even use vinyl on cards now too because it is so easy to transfer really intricate cuts. My friend just bought a Silhouette and I've been admiring hers. wouldn't it be fun if I won one and we could work together on projects? Thank you for the opportunity. Guess I was supposed to leave a separate comment about following you on Facebook and Pinterest, so here it is. Now a Facebook follower too. Wow! That's such an intricut cut on a small-sized image, and it cut perfectly! I'd LOVE to win the Portrait so I could give this a try! Thanks for the chance!!! Am now a full fledged follower of all things!! Would love to have this. I'm always trying to force myself to try new things and learn more and this machine would be a great way to do all of that. I'm impressed with all the cuts you have made worth it and would love to give it a try. Thanks for the chance. I follow both your blog and Facebook page! Thanks for the chance to win the Portrait!!! I look forward to receiving your e-mail every day. Thanks for all the great ideas and a chance to win something so awesome! Oh I need this machine :) Thanks for the chance to get one. I follow your blog and also on Facebook. I look forward to receiving your emails - you share some great info. Thanks for the opportunity to win! I am a subscriber--what a great giveaway! Love that project. I have never used vinyl but would love to give it a try! WOW Linda! this is awesome. I have been a follower of both the blog and facebook. Thanks for the review of the vinyl I will check it out. Hi Linda, I have followed your blog for a long time and I love it. Always something new and fun to learn. Thanks for all your hard work and the this opportunity to win. Thanks so much for another chance to win. WOW! !This is AWESOME! !Thanks for the chance to win!! I'm already a follower and love all of your wonderful projects. Thanks for the chance to win a Silhouette Portrait. I like your project. Thanks for the chance to win!! The tin is beautiful! Follow your blog and love your projects and tutorials. Thank you for the chance to win. The tin is just beautiful. What a clean cut. I follow you through email and check out your blog all the time. I love your blog. Thank you for a chance to win this great prize. I am a follower of your blog. I love your projects. I would love to win a Silhouette. Great job on the storage container! And thanks for the chance to win! I follow you on FB and I subscribe by email. Thanks for the chance to win such an awesome giveaway!! I follow you thru email and Facebook. Thanks for a chance to win a great little machine. Thanks for a great giveaway and all the inspiation you give us. Thanks again - another chance to win! I love how delicate that doily is! I'm already a blog follower. How exciting! I've been looking to purchase a silhouette, I have a cricut and am wanting a little more versatility. TY! Been a follower for quite a while. Thanks for the great giveaway, I would love to win. I love the doily cut. Anyway, I've been a follower for a long time. Thanks for the giveaway! Oh, I'm a Facebook fan of yours as well. Thanks again! I am a subscriber to your blog already! Have been for some time. Love your Friday posts. Thank you for the chance to win! Looks like such an incredible machine! Thanks for the chance! Hello, I'm a subscriber and a follower on GFC. Thanks for a great giveaway! I've followed you for a long time on Google Reader. Thanks for the chance to win this terrific prize. I follow your blog and would LOVE to have a chance of winning the Silhouette! I've heard so many good things about it. I'm a blog follower. Thanks for a chance to win. Wat een geweldige kans om die te winnen. Love the intricate cuts! Puts my Cricut to shame! Thanks so much for the chance to win! I am following your blog and have liked your FB page. Thanks for chance to win such a great prize. Thanks for the chance to win. I see your projects with the Cameo and I'm jealous I don't have one! I am a follower and a subscriber. Your site is one I look for on a daily basis. I would love to win a Silhouette, it is on my Birthday Wish list. I follow your blog. Thanks for the chance to win. Hello: Love your blog! Would also love to win. Thank you for doing so many give-aways. It's my birthday today! I'm dying to get this machine. Thanks for the chance! great giveaway!! I'm a long time follower, since joining cricut circle in 2011 was it?! love your blog and videos! very inspirational! Linda, I'm also a Facebook follower! love your Sunday SOS! I'm a faithful Facebook follower. Thanks for the second chance to win! THANK YOU SO MUCH FOR ALL THAT YOU TEACH US. I WOULD LOVE TO WIN THE GIVE AWAY. IT WOULD BE A GREAT ASSET IN MY CRAFT AREA. I am a follower, never miss a post. Nice giveaway. I am a follower of your blog and I love to see everything you make with the Silhouette! I'm a follower of your blog! Thanks for the chance to win! An awesome prize and I would love to win. I have been a follower for quite some time now and you continue to amaze and inspire me with your projects. I would love to win this machine. I've wanted one for so-o-o-o long. I've been a follower for quite some time and thoroughly enjoy your many talents that you share with all of us. Thank you the opportunity to win and I also follow you on Facebook. Thanks for the chance to win :) I have been a follower of you blog for a while. Anything that is like stickers is automatically amazing! Thanks for the chance to win. I follow your blog and love it. I would like to try the vinyl. WOW!! Another chance ! YEAH!!! One of these (unless I do get lucky!) I'm going to have to get one!! Thanks for the chance! A SUBSCRIBER HERE...I hear so much about how easy and smooth the Silhouette cuts...would be excited to try it out...but I would give it to my daughter for her stay in the hospital during her bone marrow transplant(she will be there for awhile,something to keep her busy)...Thanks for the chance!!! I love your vinyl project! It's beautiful! I would love to win the Silhouette, so thanks for giving all of us a chance. I'm also a follower on FB. Thanks again for this awesome chance! Wow Linda, how lucky for yet another chance to win the portrait!!!!! Following your blog certainly convinced me that I need to own a Silhoutte. I just love all the projects you have been doing with it. I have been following you for some time now and just think you are awesome. Thanks for sharing so much with us. Thanks so very much for the chance to win the Silhouette machine, I'm an excited follower!!! Loved your video on the Mod Podge Glazes and cannot wait to try it!!! Thanks again! I would like to jump on the Silhouette bandwagon! I follow your blog and find lots of inspiration. I'd LOVE to win a Silhouette! I also am already a follower as well. Thanks for the chance to win! I am a subscriber & follower of your blog & enjoy reading it! I would love to win this cutter :) Thanks so much for the chance. am a follower here and liked your page on facebook. I think it is awesome that you are able to give away a Silhouette and would love to be the winner. Have always wanted a cutting machine. 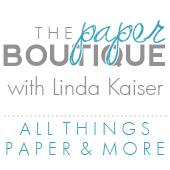 love your newsletter, love your store and i follow you on facebook! thanks!! I have heard great things about this machine! The cuts are great. It is on my ever growing to get list. Thanks for the chance. I follow your blog and also subscribe to it. You did a great job decorating the tin! Thanks for the chance to win! Thanks for the opportunity. I wanted to order some of the vinyl but could not successfully enter the Silhouette web site. Bummed. Love how intricate it cuts. Love your projects. Thanks for the chance to win the Portrait. I would love to be able to give the Portrait a go. Have just used the Cricut. Pretty incredible how detailed the image is.... Love your beautiful project and thank you for the giveaway. I already follow your blog. Hi Linda! I'm so encouraged and impressed to see such intricate cuts with the vinyl. I love the beautiful design on your project! Thank you for another chance to win! I'm already following you and also on your fb page :) Have a great weekend! I'd love to win this! I already follow your blog! I love your style and am excited to be following your blog! Wow! How fun would this be to win! I have been following your blog for some time. Would love to win a Portrait! Thanks to Silhouette for the giveaway! I would love a chance to win! I've been following your blog for a while and I love your projects! I also follow you on Facebook! Thank you!! As I announced to you on You Tube, blog spot is new to me, but this was a good time to learn to use and follow. I have followed your You Tube channel for a long, long time. I learned to make glitter glue from finger nail polish from you.LOL! Now, am on my way to Facebook to announce you and follow You there. I'd love, love, love to win the Silhouette. Oh yeah!!! I'll be right back Linda. Which is my real name also.but spelled Lynda. Thx, GracieRhae, Ut. I love all of your post. I look forward to them. I would love to win the Silhouette. Looks like a great machine. Thanks for the give away.